You're welcome! Fancy looks fancy! I miss chatting with you, hope all is well. Trial keeping all of us busy! This is PERFECT the way it is!! Been busy taking my sister to Birmingham for testing and dr's appts. It is also growing season and I've been mowing and bush hogging into each evening and then trying to keep up with the trial. Friday Mac goes in for teeth cleaning, ears and nails. He now has to go under a general for this to be done since the last fiasco. It is really hot (high 90's) thank heavens for an A/C tractor. Hi Brandi..can you dress me up for 4th of July? Thanks!! I'd be happy to, Airlinemonkey! I'll post it here before I go to bed tonight. It is the maximum width for our forum. At least I think that is the one you were wearing the other day. I don't recall making a smaller one. Airlinemonkey, you have a red, white and blue necklace, a patriotic bow, animated water and real fireworks! You and Nordie are very welcome! I'd like a Patriotic Avatar, Brandi. I'll use it, I swear! Is there any way I could get this pic in it? 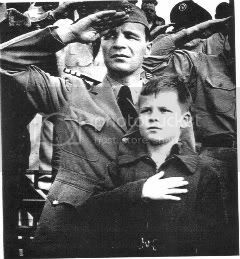 This is my Dad and brother at a flag raising in 1958 in Japan. This picture was made into a Savings Bond Poster...If it's too weird, let me know. I thought the picture would be great framed in red, white and blue in sepia tone. I also did not know if you wanted your monkey in it, so I did some without your monkey, and one with your monkey blinking and overseeing the picture. What a great picture, monkalicious! If you had something else in mind, let me know! Great picture monkalicious. Great job you did Brandi. THANK YOU for dressing up Josef!! You and Josef are very welcome. Thank you so much Brandi! It suits me! In fact my airline uniform is red,white and blue! You are so talented!! Did I tell you how much I like my arm resting, on the circle? (I believe I did mention that before). I enjoy the composition,too. If you ever have any suggestions or requests concerning the designs, please feel free to add them! Here is a properly resized image to use as your avatar for the Fourth of July. The one you uploaded to the forum was too large, and the forum software resized it to fit, and it lost the animation. Whenever you would like a new avatar, please leave me a post here and I'll be more than happy to design one just for you. Thank you so much, Brandi! I love your avatars and was feeling a bit "naked". I appreciate your allowing me to use it and teaching me how to use one properly. It's my first time using an avatar here at SM. You are welcome, New Monkey. Just remember, come back here and post when you are ready to change out of Fourth of July. Let me know what monkey or thing you want as your avatar theme, and I'll be happy to design it into an avatar for you! Attaching a properly sized avatar to the forum does not kill the animation. It only gets killed if it is too large and the software has to resize it to fit the allowed dimensions. Brandi, I know you are busy with the trial and many thanks for all the photos. Could you change the one of Nordie laying down with the fireworks in the background to one without the fireworks and maybe a moon. He loves to howl at the moon, he is such a moon doggie. I wanted to change clothes, but thought 4th of July a little early. If you don't have time, no worries. Page created in 3.011 seconds with 19 queries.